Many of us use one genealogical program or another and nearly all of them have a very graphical look to them. You can see your family group sheets, display charts, etc. This website is much the same except that, instead of it being on your computer, it is on the internet. This walk-through will introduce you to the primary functions of the site. The bold, links embedded on this page will open a second window (or tab); you can follow these steps in the new window/tab while referencing the steps here. In either case, the following link opens a new window (or tab) to our Home Page. Features of that page can be seen and the window/tab can also be used to explore the features discussed below. On the home page you will see links to the various sections of the site, links to family and ancestors, and a Search box on the right side of the page. Home - Takes you to the front page of the this website. On the right hand side of the header, you will see four drop down menus: Find - Media - Info - Help. These can be used to quickly access any area of the site. If you hover the mouse (not click) you will see drop-down menus that give you a large number options to help you navigate this site. In the search box (right side of home page), put "Mitchell" (without the quotes) in for the Last Name and "Frederick" (without the quotes) in for First Name and press <Enter>. This will give you a list of the results that were found to match. On this list, click on the name of the Frederick James whose Person ID is "I82" (Born 1882 Tetbury, Gloucestershire, England). You are now at his Individual Page, the header of which you see below. Take a few minutes to orient yourself with the layout. This is the "core" display of the genealogy pages. The standard view shows all of the most pertinent 'Personal Information'; the other views listed in the brown bar limit information to a specific category. Note that the personal information is divided into three sections -- the Individual selected, his/her Parents, and his/her Spouse and Children (if any). Clicking on the "Group Sheet" link next to the appropriate Family ID will bring up either the Parental Family Group sheet (parents and siblings, with the individual as a child) or the Selected Person's Family Group sheet (spouse and children, with the individual as a parent). Try these out. You will also see an event map showing the location of the main events in the life of the individual. 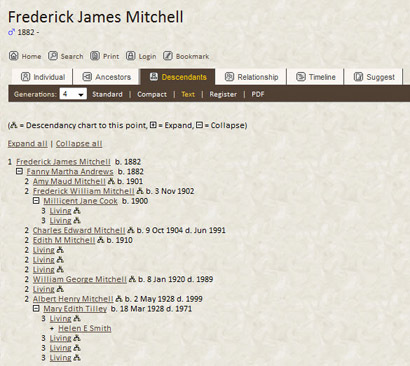 1) Click on " Ancestors" and you will find a dynamic chart. The default view is the "standard" view (4 generations). (Note that each generation is shown in a slightly different shade, getting progressively lighter with each older generation.) Clicking on any of the names on the chart will take you to the individual sheet for that person. Notice that there are little blue arrows pointing down beneath many of the boxes. If you hover your mouse over the arrow (not click!) a drop-down list for that person will open. You can click on a name in that sheet to take you to their individual sheet. Clicking on any	 icon will show the next generation above (ancestors); clicking on the icon will show the ancestry starting from the next generation below. Wherever you see the pedigree icon , you clan click to show the ancestry from that individual. Also note that in the brown bar just above the chart, you can specify the number of generations you want to display (beware that the page will get increasingly wider and longer, requiring more scrolling, as you increase the number of generations). 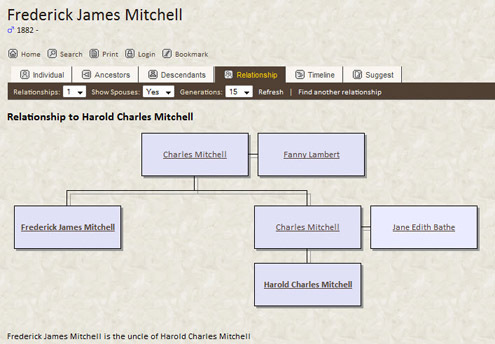 Just click on the "Find" button under "Person 2" and search for "Harold Mitchell" (remember, last name on top). Select 'Harold Charles Mitchell' (ID-I5528) and click "Calculate"
Searching for a name in the database. If you know who you are looking for, then you are already halfway there! Just use the Search boxes on the right side of the header, at the top of each page, and you will be shown all the records in the database that match your request. If you need to be more specific in who or what you are looking for, use the "Advanced Search" feature on the home page or by clicking on the search icon ( ) in the upper left hand corner of every page. There, you can specify several different criteria to search against, including birth and death information as well as spousal information. You can even search by event or place. (ii) if you also know her first name, click on the "Search Families" link and then you will be able to enter both the husband/partner's name and her first name. Thanks and appreciation are due to Graham Chamberlain, Jerry Liebowitz, Eddy Belew, Bret Rumsey, and Steve Winslow, whose TNG genealogy websites' Help pages inspired this page.